In every clinic that I teach, people ask how they can get their horse to trust them more, yet I see them constantly doing things that show their horses that they lack judgment and make poor decisions. It’s funny that horses see this so clearly, but humans—not so much. Your job as the leader is to watch out for the safety of your followers. Every time you give a horse a reason to question your judgment–because you’ve put him in a situation he perceives as unsafe–you’re chipping away at his faith in you. Here are three common mistakes I see people making every day with their horses that give the horse good reasons not to trust their judgment and leadership. Watch for these mistakes closely the next time you interact with your horse; make sure that you are the leader your horse deserves. 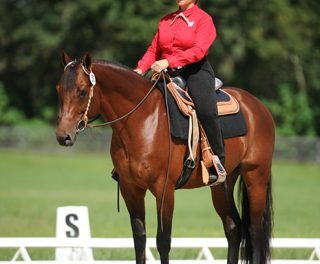 An obedient riding horse goes in the direction you dictate, at the speed you set, without argument. The problem is that horses are much more spatially aware than humans. Horses worry about the other horses in the arena and they expect the leader to watch ahead and prevent any potential horse-to-horse collision or conflict. Most people are so consumed with themselves, that they are oblivious to their surroundings, including what the other horses are doing. Your horse always recognizes your lack of awareness, because his safety depends upon it. He sees the hazard even when you don’t. I often see this when people are longeing or circling in an arena where there are other horses. First of all, let’s be clear on this, longeing a horse in an arena where horses are being ridden is dangerous and should never happen—that’s a pretty basic safety rule. At clinics, when everyone is doing circling work (and no horses are being ridden), people will still put their horses on a collision course with another horse. The horse always sees it; the person seldom does. If you do this, your horse starts doubting your judgment. I also see this in the arena when all riders have their own agendas. The smart riders (and the good leaders) are looking well ahead. But invariably, there will be riders totally focused down on the horse’s withers, concentrating only on themselves, not even aware of their own horse let alone the other horses in the arena. Being aware of danger in the environment is such a basic job of the leader that it is hard for your horse to think of you that way when you are failing at such a basic task. Your horse may view any given situation much differently than you and he sees danger where you may not. We, as humans, tend to analyze, rationalize and justify the situation, while to your horse it’s simple—it’s either safe or not. I often see riders and handlers put their horses in very precarious situations, with seemingly no awareness that it was risky for the horse. Perhaps the rider had no awareness of how the horse views the situation. Or perhaps the rider made an executive decision to override instinct and go into an unsafe situation anyway because her logic tells her it’s safe (logic that the horse may not possess). This happens at my clinics while we are working on teaching the horse to step back with a subtle hand signal. I always catch people backing their horse into a solid fence or worse, another horse. He knows it to be wrong and unsafe. People get so caught up in the exercise of teaching the hand signal, that they lose all awareness of the surroundings and abdicate all responsibility for leadership. Similar examples from the ground include asking a horse to step into a trailer, then standing right in front of him so he would have to bowl you over in order to comply. He’s pretty sure he’s not supposed to do that. Or asking the horse to trot on the lead line, but remaining right in front of him so there’s nowhere for him to go without running into you. It feels like a trap. When riding in a group, it’s your job to keep your horse safe. Still, I see riders pass between a horse and the fence. Entrapment! There’s a reason fundamental safety rules exist—and it’s a fundamental rule to never pass between a horse and the rail. Horses can be very opportunistic when it comes to aggressive behavior and many horses will kick, given this opportunity. Your horse knows that as well and he has good reason to question your judgment when he is the one that will likely take the blow. 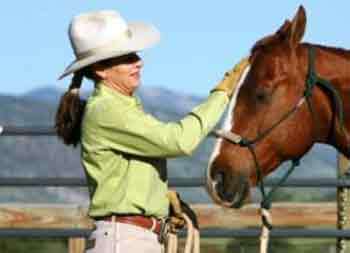 Horses, by nature, are very willing animals that instinctively seek out approval and acceptance from the herd leader. 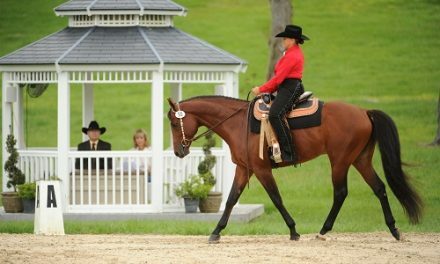 When you are a fair and consistent leader, your horse will work hard to please you and will feel safe and content in your presence. When you notice his efforts and praise him for giving of himself, then your relationship kicks to a whole new level. There’s no limit to how hard a horse will try to please you when the right kind of give-and-take relationship exists. We humans tend to fall down on our leadership in some very gut-wrenching ways to the horse. Often I see riders give a cue to the horse, then inadvertently punish him for responding to the cue. The most common example of this occurs in the canter departure. The rider may lack confidence. The horse is cued to canter, then hit in the mouth with the bit when he does (because his head moves into the bit in that moment). It hurts his mouth and scares him, leaving him with the feeling that he is being punished for doing what was asked. Sometimes I see riders miscue their horse then admonish him for responding to the cue given. Then the rider wonders why he suddenly stopped responding to that cue. 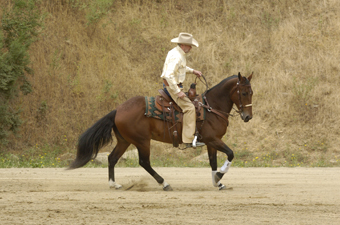 A perfect example is seen frequently when the rider, with two hands on the reins, asks the horse to turn with the inside rein, then starts pulling on the outside rein too, effectively pulling the nose in two directions at the same time. Pulling on two reins to turn puts incredible undue pressure on the horse’s mouth. It appears to him that you asked him to turn, then penalized him with the outside rein when he did. In that moment, the mistake was the rider’s (it’s the leader’s job to be clear in her directives). The horse did exactly what he was told to do then was admonished for trying. Being a good handler and good rider takes a lot of time and effort and a lot more awareness of the horse. The more we can think from our horse’s point of view, the deeper our level of understanding of his behavior and the more rewarding the relationship with the horse. They are complicated animals, perceiving much more about us than we do about ourselves. That’s what makes horses so therapeutic to our souls. Seek out help and have others watch you—they’ll catch on faster than you about what cues you may be giving the horse. They’ll see what you can’t. Let your horse guide you. He won’t lie to you; he either thinks of you as the leader or not. If he’s resistant and argumentative, he probably has a good reason. If he trusts you and looks up to you, you’re a good leader.